Helipaddy were chuffed to be invited to look round the LAA’s class 1 operations base in Central London. 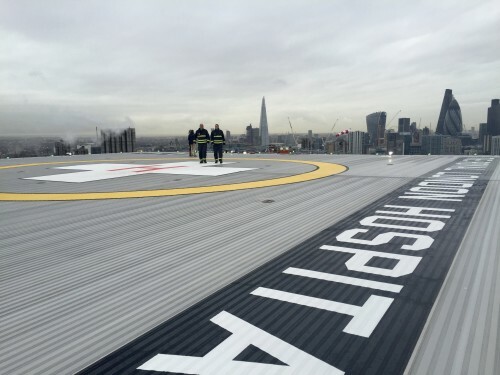 The helipad itself is above the Royal London Hospital. It’s a bit of a different world up there. Before taking the picture below the red MD902 Explorer just did its “backwards” take-off profile and then flew off to Hyde Park to deal with someone falling off scaffolding (who we heard is doing well). This is one complicated operation and, needless to say, pretty much swamped in complex procedures. The ops room is like a hospital theater with people moving around constantly, alarms going off and coffee machines whirring. The view from the pad is, well, amazing really. It is larger than we had imagined and obviously incredibly easy to find from the air. The MD902’s can reach 140 knots and, as part of the LAA’s 2 helicopter fleet, cover the whole M25 area which makes up 600 square miles and 10mn accident-prone people. This means lots of tight landings (hence the NOTAR tail) and a minimum of 1 hour fuel on board to be mission ready. Captain Neil Jeffers and his colleagues are regularly landing on multi-storey car parks, playing fields and box junctions, anywhere 80 foot square. 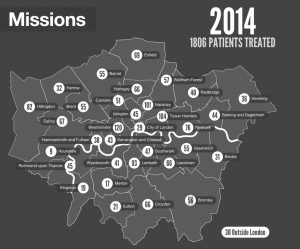 Don’t imagine there are medical helipads all over London - there is just one other. order to avoid “burning baby” syndrome, a rather extreme form of get-there-itis. Next time you see G-EHMS or, now, G-LNDN flying around or on the radio then listen out carefully as they will be on yet another medical mission - over 1800 patients were treated last year. We’d like to thank Chief Pilot Neil Jeffers, shown, for showing us around. Neil has over 7000 hours flying time and loves it so much that he ran 8 marathons in 6 days to raise funds for the LAA!